We have further extended our range of quartz crystals and clock crystals and now supply even more series from manufacturer Epson. 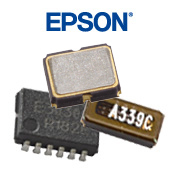 All of the new Epson quartz crystal series are offered in SMD casings. The clock crystals in the FC-135, MC-146 and FC-12M series in plastic housing have a frequency of 32.768kHz, frequency tolerance of ±20ppm, operating temperature range of -40 to +85°C and load capacitance of 6pF to 12.5pF. The SMD quartz crystals in the FA-118 and FA-128 series are available in the most popular frequency steps from 16 to 52MHz. Both series offer insulation resistance of 500MOhm. The frequency tolerances are ±9ppm to ±30ppm depending on the type, operating temperature range is from -20 to +75°C or -40°C to +85°C. The SMD crystal oscillators in the SG210 and X1G series in 2.5x2x0.9mm metal housing in frequencies of 10 to 156MHz have a frequency tolerance of ±50ppm.